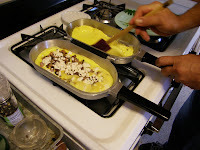 NOTE: This was our first ever post on cooking an omelet with the Duplex Utility Pan and we were still in the "discovery and experimentation" stage. 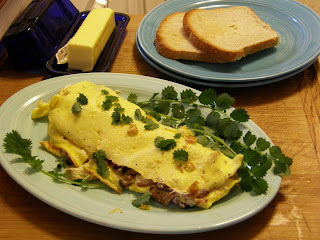 For a revised and refine method, skip to our second blog post on preparing a Guardian Service omelet. 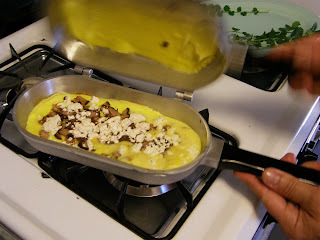 We admit that preparing omelets in this pan remains a bit of a mystery (UPDATE*). Part of the trouble may be our range's burner size (there's no position that allows us to heat both sides of this pan on one burner, so cooking or warming the unit while open requires constant monitoring and maneuvering). Add water to eggs and beat until light. Add seasonings. Melt butter in Duplex Pan over "medium"
heat. When it starts to brown, pour the egg mixture into one side only. When edges brown, close pan gently and reverse. Open at once and complete browning (For variety, add 1 cup chopped vegetables—asparagus, peas, ham, bacon, etc.). Filling (leftovers, veggies, cheeses, cold cuts, smoked fish, dips or spreads... the possibilities are endless. Raid the fridge and pantry for that bit of leftover something). Butter both sides of the Duplex Pan. 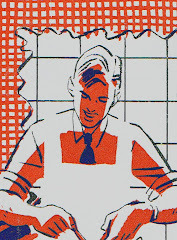 Warm the open unit, alternating sides over a medium flame, until the butter begins to brown. 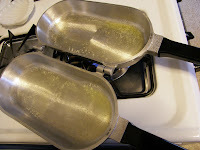 Pour half the egg mixture into each side of the unit and continue to cook over medium heat, alternating each side until the edges begin to crisp (the aluminum retains heat well enough that both sides continue to cook, but alternate ever 30 secs or so to keep both sides working). 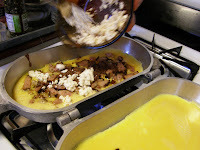 Add the filling (pictured: peppered bacon, chevre and chopped Kalamata olives). Run a spatula along the outside edge of the omelet to discourage it from sticking and then, in one quick motion, close the unit. Cook for 1-2, flip the unit and continue to cook for 1 minute, then open (scraping off whatever bits may have stuck), turn onto platter, et voilà: Omelette du Chevre, Bacon et des Olives (pictured with salad burnett garnish). *UPDATE: I adapted my omelet technique this morning with improved results. 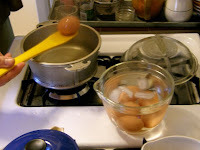 Heat seems to be the key for eggs in this pan; the pan should be hot enough for cold water to reach the "ball" stage (see below). If properly heated the butter will brown in seconds and the omelet will release from the pan just as easily as from the non-stick teflon variety—but it may take some practice. 1) Heat one half of the Duplex Utility pan over a medium heat until it passes the "water test" (I wrote about this test on the Griddle/Broiler in previous posts here and here--when hot enough, water droplets will retain a ball shape and "dash about like mad"). 2) Add a Tbsp. butter and evenly coat the pan, working quickly so the butter browns but doesn't burn. 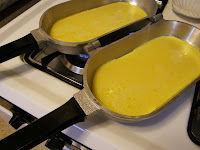 Add egg/water mixture and heat until edges brown and pull away from the pan's edges. 3) Now: shift the pan and heat the empty side of the pan as you did the first, adding butter to coat the surface. In one quick, gentle motion, close the pan and flip it. Open at once and finish browning. Here's another simple standard which we've adapted for the Guardian Service Casserole/Tureen cooker. Soufflés have a reputation for being difficult, but nothing could be easier once you've mastered the basic technique. A soufflé baked with this technique won't scale to the same lofty heights as one cooked in an open casserole, but the stove-top method conserves energy and still results in a frothy, if slightly denser, soufflé. The "waterless" approach results in more of a steamed mousse or timbale, a once ubiquitous offering at "ladies' luncheons" of yesteryear. Melt butter in the GS Casserole unit over medium heat, add onion and fry for 3-5 minutes until tender. Blend in flour and slowly add milk, stirring constantly until thickened. Turn heat to low and add salt and pepper. Beat egg yolks with a dash of hot sauce and add to mixture. Heat and stir for 1-2 minutes, but do not allow to boil. Remove from heat, add tuna, parsley, dill and capers and cover with a piece of wax paper to keep a skin from forming on the surface. Preheat lidded Tureen unit while preparing the egg whites. Whisk egg whites until they begin to foam (if you've got one, a copper bowl is ideal) , add the cream of tartar and continue to beat until they become stiff. 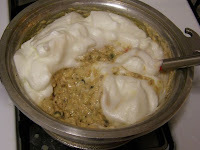 Stir 1/4 cup of the egg whites into the mixture, then fold in remainder, careful not to overwork. 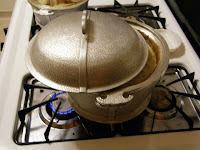 Lower the Casserole unit into pre-heated Tureen, replace lid and bake over medium heat (1/2 flame on gas ovens) for 45-50 minutes or until puffy and the center is cooked through. Optional: Use the stove-top browning technique (described in earlier posts and pictured below) to reflect heat back onto the crust. Only a few egg recipes are included in the Guardian Service Tested Recipes cookbook: Scrambled Eggs, Guardian Omelet (I'll take a look at cooking omelets in the Guardian Service Duplex Utility pan in a future blog post), and a Tomato Flower Salad that calls for hard-boiled eggs, but no guidance on cooking hard or soft-boiled eggs in aluminum cookware. With Easter approaching it's the perfect time to offer some advice on the subject. There's nothing remarkable about boiling an egg, but after years of cooking them, it amazes me when I still screw them up. Use too much heat or leave them to cook for too long and the yolks can green and the whites turn rubbery. As food nutritionist and Guardian Service advocate of the day Adelle Davis writes, "The texture of either a hard-cooked or a soft-cooked egg depends on the initial temperature of the water and the eggs, the number of eggs cooked, the amount of water used, the degree to which the utensil holds heat, the temperature to which the water is heated, and the length of time the eggs are left in it. If that is easy, I give up... The only way perfection can be obtained is to measure the water and to use a stop watch and a thermometer, none of which i expect a housewife to do." I don't expect a housewife—nor any of us—to run his or her kitchen like a laboratory, but a few steps will help you get more consistent results: soft, mealy yolks and firm yet tender egg whites). 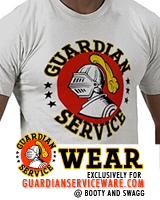 And Guardian Service cookware is renowned for evenly retaining and distributing heat, which takes some guesswork out of the equation. Bring approximately 1 quart of water and 1 tsp vinegar (or lemon juice) to boil in the Guardian Service Dome Cooker (1.5 or 2 qt) or the Guardian Service Casserole Unit. Use room temperature eggs; slip carefully into water: 4 to 8 eggs*. Cover unit; simmer for five seconds and remove from heat. Let stand 8 minutes for soft-cooked eggs, 10 to 15 for hard-cooked eggs. Gently remove eggs and transfer to a bowl of ice water to arrest cooking. *Eggs cold from the fridge? Alternately, you can begin with cold eggs in cold water, but you're less likely to get consistent results since there are more variables involved with the cooking time depending on everything from the outdoor temperature to that of your tap water. 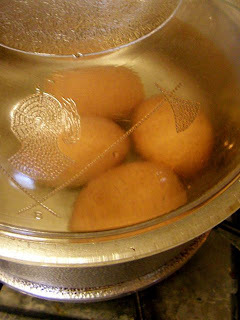 A trick which will also help to prevent cold eggs from cracking is to use a pushpin to create a small airhole in the larger end of the egg: "Its metal pinpoint is short enough not to rupture the membrane that separates the trapped air from the albumen but is thick enough to make a convenient hole for the air to escape through as it expands while being heated in the simmering water," writes Howard Hillman in Kitchen Science (Houghton Mifflin). 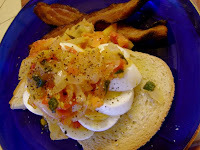 Pictured below: hard-boiled eggs on toast with sauteed tomato, onion and caper, accompanied by Niman Ranch bacon. 1) When cooking eggs in aluminum cookware, add 1 tsp of vinegar or lemon juice or 1/4 tsp cream of tartar to help prevent staining (caused by the hydrogen sulphide developed by heating the eggs). This aluminum oxide staining is harmless and can be removed by either cooking foods with high acid contents such as tomatoes, apples, lemon or rhubarb, or by boiling 2 tbsp of vinegar or 1 to 2 tsp of cream of tartar per quart of water, then polishing with soap-filled steel wool. 2) Never HEAT eggs, warm them. Writes Adelle Davis in the nutrition classic Let's Cook It Right, "If you submit eggs or cheese to high temperatures, the protein quickly becomes tough and some of its health-promoting value is destroyed. Cook booth cheese and eggs gently with low heat at all times." 3) Peeling a pain? Again, starting with simmering water and room temperature eggs helps when it comes to removing the shell, since the egg's albumen, or white membrane, retracts when the egg is carefully ladled into the simmering water. Older eggs (a week or more) will shell more easily, since their whites have already begun to shrink. 4) Perhaps most important of all: the source of the eggs themselves. If you haven't explored the difference in flavor and texture between a factory farmed egg and one from a pasture-raised hen, I invite you to do so. Pasture-raised hens have access to a natural diet of grasses, grubs and bugs; it was food for our grandmothers, it's food for you and me. And I'm less concerned with the cholesterol from a real food source than by what frankenfood dangers lurk in egg substitutes... besides, their both cholesterol and flavor FREE. If you don't have your own backyard chicken coop (I did growing up and I long for the day I do again), look for eggs at farmers' markets or pasture-fed sources.